ADDIS ABABA (Reuters) - The leaders of Ethiopia and Eritrea announced on Sunday they would re-open their embassies, hailing a stunningly swift rapprochement between bitter regional enemies at their first summit since a war two decades ago. The two leaders personally symbolized the breakthrough, embracing warmly and swaying side by side to live traditional music at a lavish state dinner in the Eritrean capital. They opened phone lines between the two countries that had been cut for two decades, and land-locked Ethiopia said it would be given access to the sea at an Eritrean port. Eritrea's long-time leader Isaias Afwerki welcomed Abiy at Asmara's airport in the morning before they departed for the State House for talks that lasted all day. The men exchanged hands and a hug there, before departing for the State House for talks. Along the way, they were cheered by thousands of Eritreans who flooded the streets and waved flags of both Ethiopia and Eritrea. The two embraced again at the state dinner, hosted by Isaias and broadcast on both countries' state television. Abiy said they had agreed to re-open embassies in each other's capitals, and that his landlocked nation of 100 million would begin using a port in Eritrea, which is on the Red Sea. He did not identify which port. 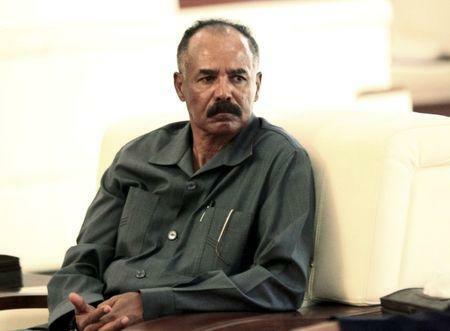 Isaias said the people of Eritrea had been waiting for this moment for a long time. The meeting was the first of its kind between leaders of the two Horn of Africa neighbors since their war 1998-2000 war in which around 80,000 people died. Eritrea achieved independence from Ethiopia amicably in 1993 but the two countries swiftly became bitter enemies. "This historic official visit ... heralds a new era of peace and cooperation," Eritrea's Information Minister Yemane Gebremeskel wrote on Twitter. The summit would "set the tone for rapid, positive changes on the basis of respect of sovereignty & territorial integrity, equality and mutual interest of both countries," he wrote. "The yearning for peace was palpable (and) we’ll decidedly move forward for the good of our people," Abiy's chief of staff wrote on Twitter, alongside photos of cheering Eritreans on the streets of Asmara waving their own and Ethiopia's flags. A direct international telephone connection between the two countries was restored "for the first time after two decades", he wrote. However, the sides did not make clear whether the most immediate issue -- Abiy's pledge to finally implement all terms of a 2000 peace deal with Eritrea -- had been addressed. "There is no border between the two countries," Abiy said, a comment whose meaning could be vague in light of the frontier dispute. Last month Abiy said Ethiopian troops would withdraw from the town of Badme, which they have occupied since the war, but the troops have not yet left. The scenes in Asmara on Sunday were unimaginable before last month, when the unexpected rapprochement began. In early June, Ethiopia announced it would honor all the terms of the 2000 peace deal, suggesting it might be ready to settle the border dispute. Eritrea responded positively, sending a delegation to Addis Ababa last month for a meeting at which Abiy announced that Ethiopian Airlines would resume flights to Eritrea. Abiy, a 41-year-old former intelligence officer who took office in April, is pushing other bold reforms to open Ethiopia up to the outside world after decades of security-obsessed isolation. He has pardoned dissidents, lifted a state of emergency and pledged to partly privatize key state-owned firms. Across the border, Eritrea is one of the world's most isolated and repressive nations and has long used the Ethiopian threat to justify hefty military spending and long-term military conscription, which has caused hundred of thousands of young men to flee, mostly to Europe. Eritrea may have seen an opportunity in Abiy's reform agenda, which marks a stark departure from the approach of the Tigrayan People's Liberation Front (TPLF), the ethnic Tigrayan party that had dominated Ethiopia's ruling EPRDF coalition since the early 1990s. Abiy is from the Oromo ethnic group, Ethiopia's largest, which led protests that brought about his predecessor's resignation in February. TPLF hardliners oppose the sweeping changes he has pledged. Two people were killed in a grenade blast at a massive pro-Abiy rally in Addis Ababa last month, with the finger of blame pointed at those opposed to his reforms.